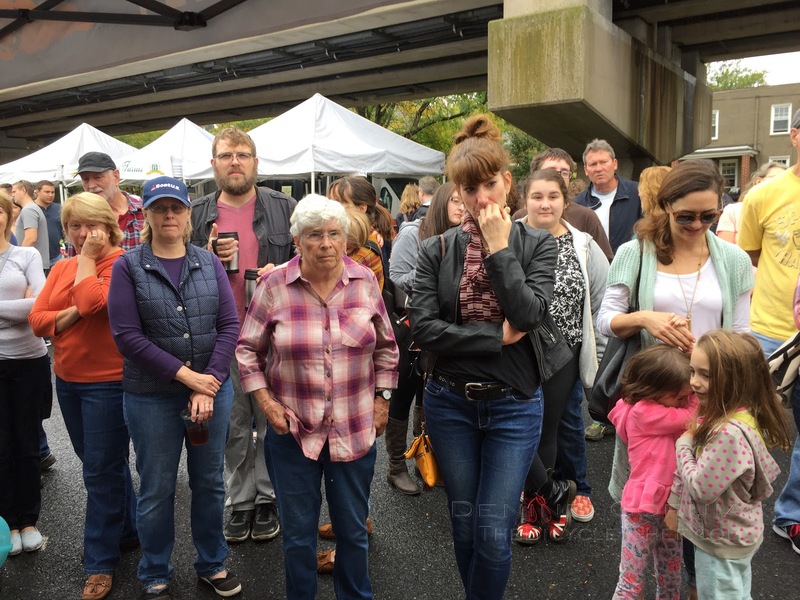 The 17th Annual Apple Pie Contest at the Collingswood Farmers' Market took place on Saturday, October 14, 2017. For the 2nd year in a row I was a judge in the one of the tastiest events of the year. There were 9 judges and 21 pies to taste but this year, the organizers decided that with the possibility of having 27 registered contestants and only 6 judges the signed up the night before the event, having so many pies and too few judges might give us all palate fatigue (and send some of us into a sugar-coma) that we would only be tasting some of the pies. At judging time there were a few less pies than anticipated and few more judges who were eager to eat. 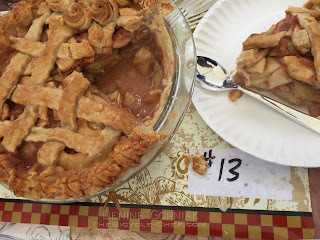 We were divided into two groups - one group of us would taste the Classic Apple Pies, the other group would taste the Apples Plus or Anything Goes Apple Pies (apples plus nuts, other fruit, caramel, sour cream, cookies, etc). This was a relief to our taste buds. Last year I remembered that after eating bites of 10 pies I couldn't differentiate between the pies and I felt sugar sick. However one learns a thing or two once you are a judge in tasting contests - eat a good protein filled breakfast. Take small bites. Feel free to spit out what doesn't taste good to you. Sniff, look, poke and inspect with your eyes before you eat. Drink lots of water in-between forkfuls. Judge Miss Mary ready to dig into the pies! She even brought her own fork! 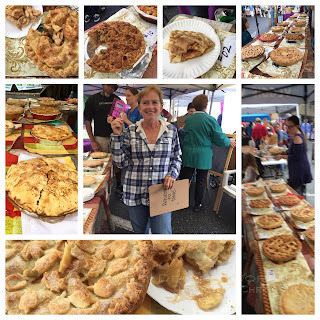 I was placed into the Classic Apple Pie tasting category - 10 pies to try. 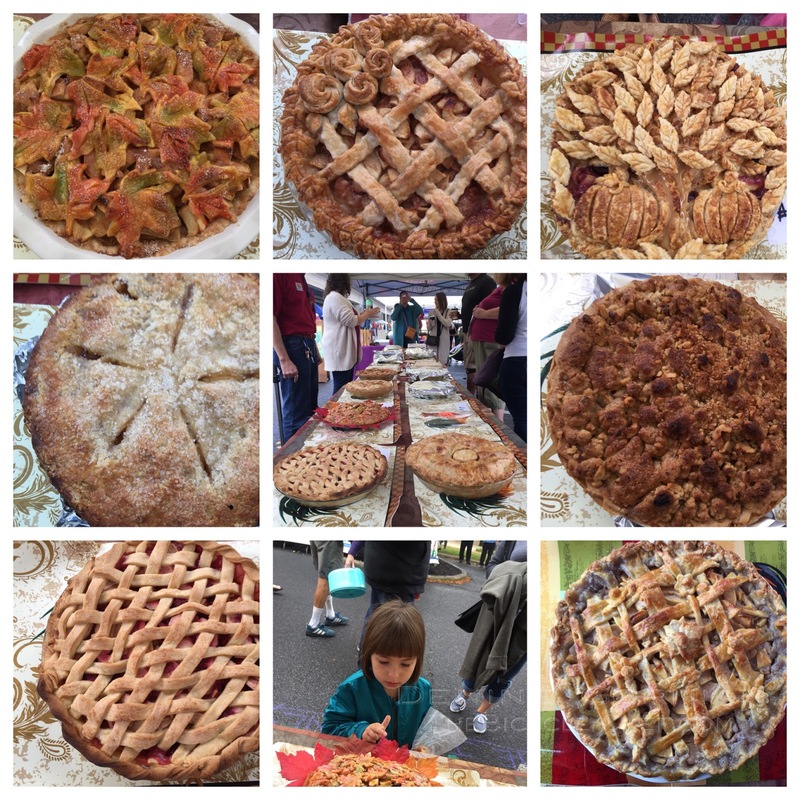 All 9 judges would be voting on the best presentation category - who had the prettiest pie in the show. We all looked over the pies and voted for the pies that were loveliest. 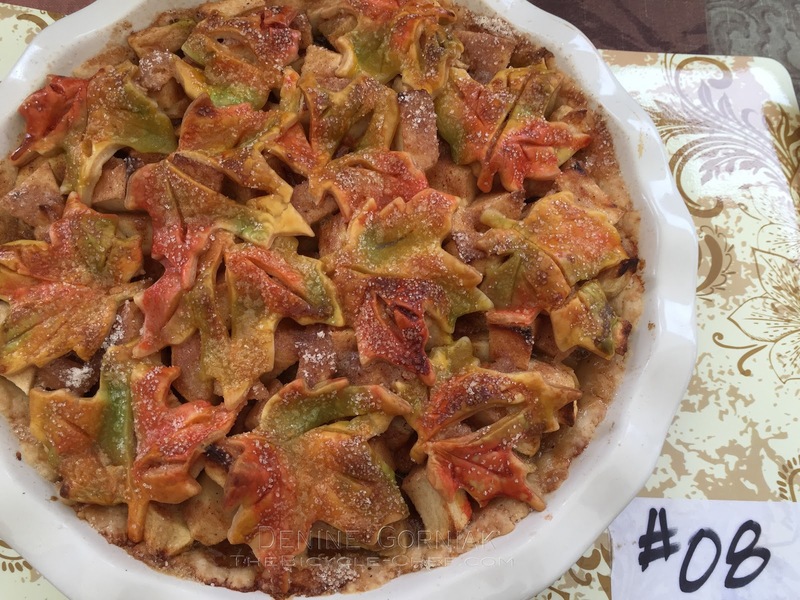 1st Place: #8 Sara Gate's "Sara's Blue Ribbon Apple Pie" This deep dish creation was decorated with an array of "maple leaves" that were dyed in autumnal colors to mimic the season's changing leaf colors. The crust and leaves had a beautiful burnish and good sugar sprinkle. 2nd Place: #13 Judy Griffin's "Not the New iPhone" Classic Apple Pie. 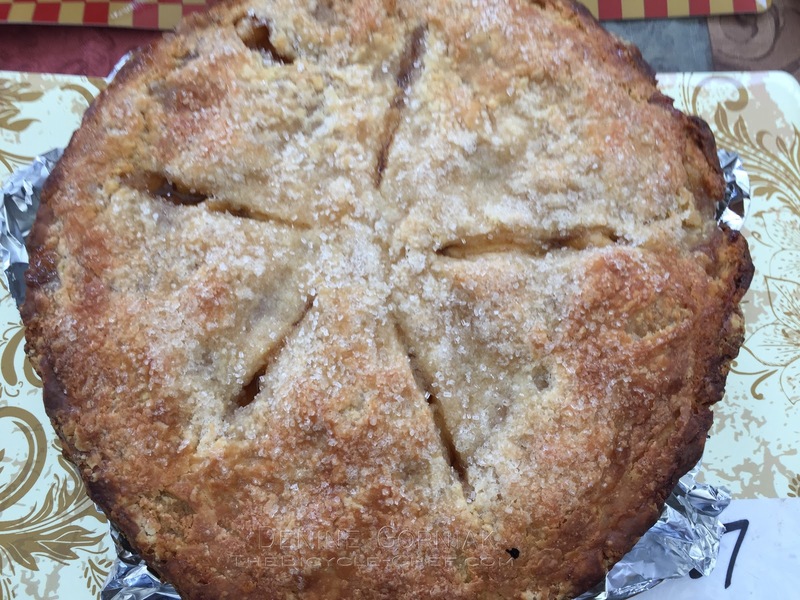 Judy's deep dish pie was decorated with leaves, lattice, and a rosette crusted top. 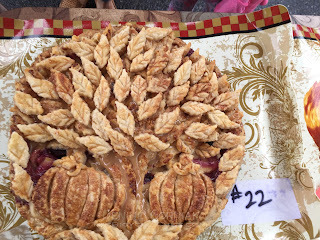 3rd Place: #22 Emily Thompson's "Caramel Apple Pie" Emily is a returning pie baker and winner - having won several times at the Collingswood Farmers' Market Apple pie contest. Last year she and her mother both won in several categories. 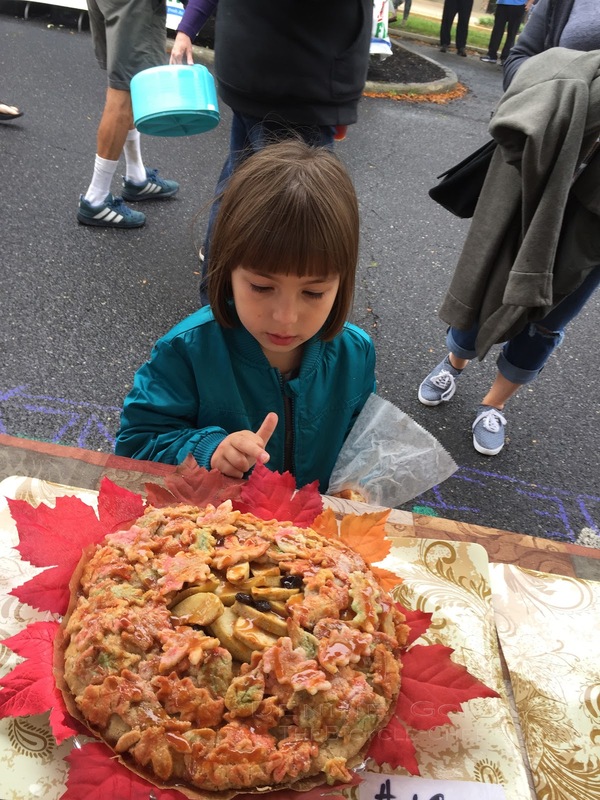 Emily is a serious baker with seriously fine skills, as evidenced in her beautiful arrangement of cut-out leaves and pumpkins adorning her pie top. 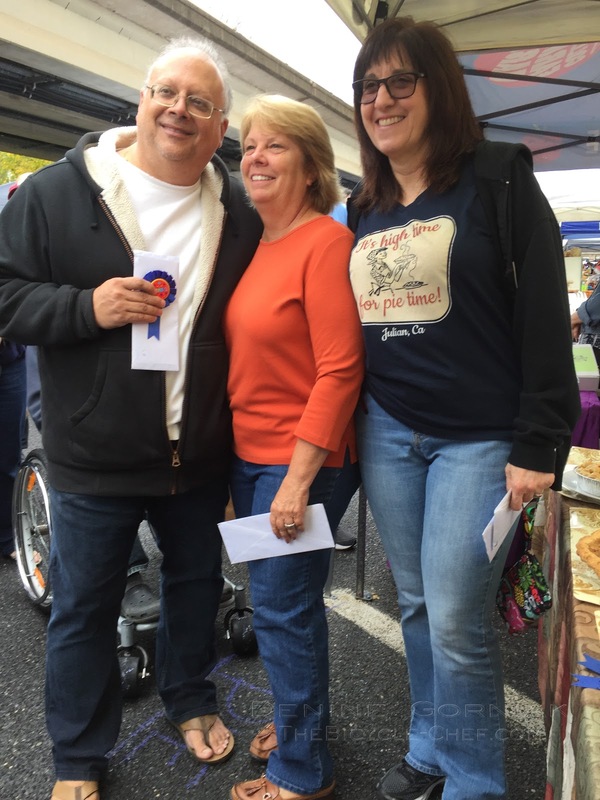 1st Place: #7 Charles DeFranco's "Mimi's Special" Charles is a returning 1st place winner, having placed 1st last year for best apple pie and best in show. 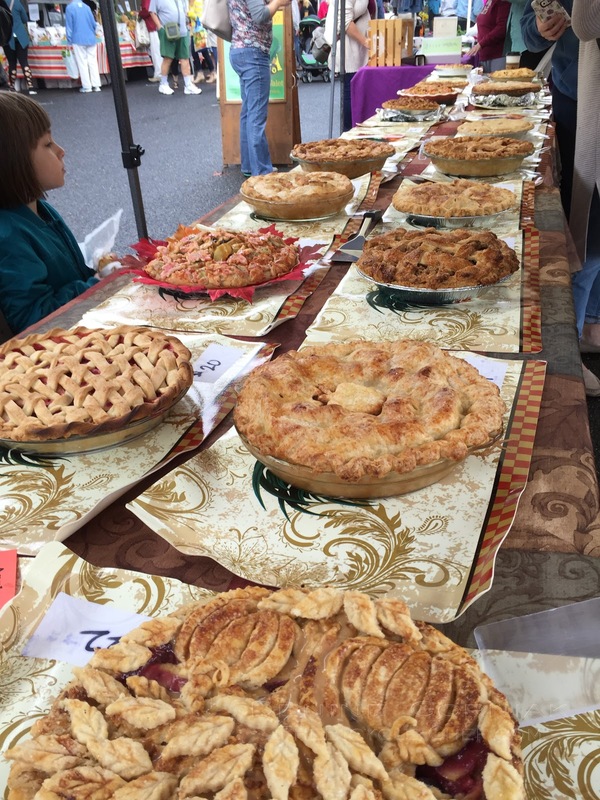 When setting out to judge the pies, I made sure to not see who placed their pies onto the judging table so I could remain unbiased. 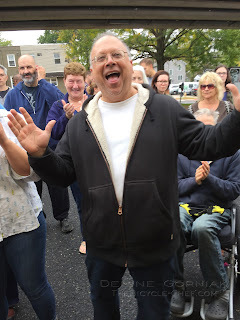 I had no idea Charles had entered the contest until I found out he was the winner! In my notebook, I wrote, "Fantastic and perfect apples and sauce...the crust was tender and perfect. 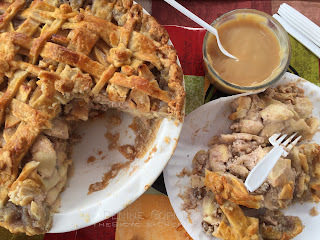 There was an almost caramel-like element to the baked apples..." The man knows what he's doing! 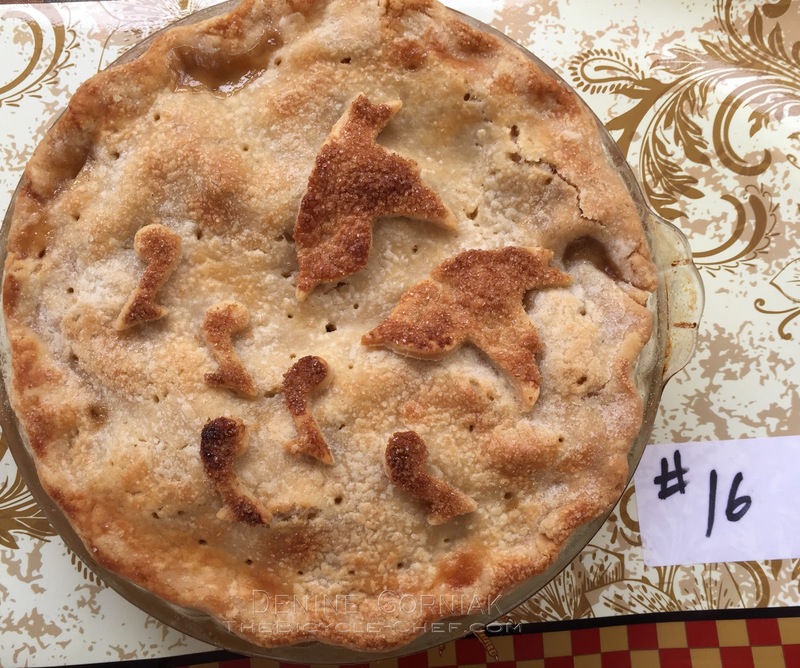 2nd Place: #10 Linda Binder's "Apple Pie with Crumb Top" Linda must have been anxious because she wasn't on hand to find out she won! 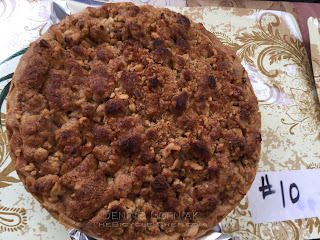 Her crumb and nut crusted pie was very good and the apples were baked perfectly. Over-all, her pie had a nice balance of sweetness. 3rd Place: #13 Judy' Griffin's "Not the New iPhone" Judy proved that taste backed up the looks of this pie. 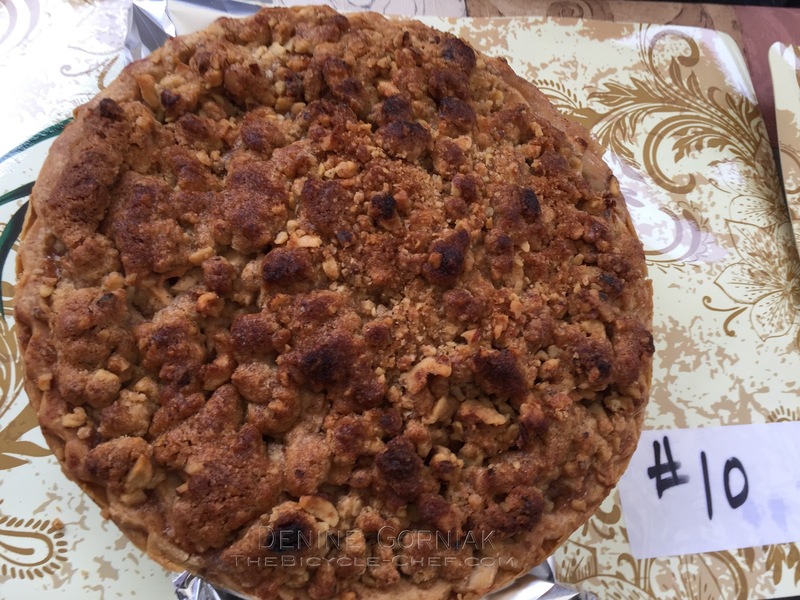 Pie #11 entered by Beth Dieterich - it had a tender crust, the apples were well-cooked and it had a pie and cake-like thing going on since the apples melded in-between and into the bottom crust and the crumb topping. I would have eaten the entire pie had it been warm! Pie #16 entered by Nancy Catalio-Gudonis - the crust was tender and nice, the sauce the apples gave off was perfect and there was a hint of bourbon, or vodka, or maybe even vanilla. Whatever it was it was a nice back note. The pie was homey and delicious with a good brown colour. 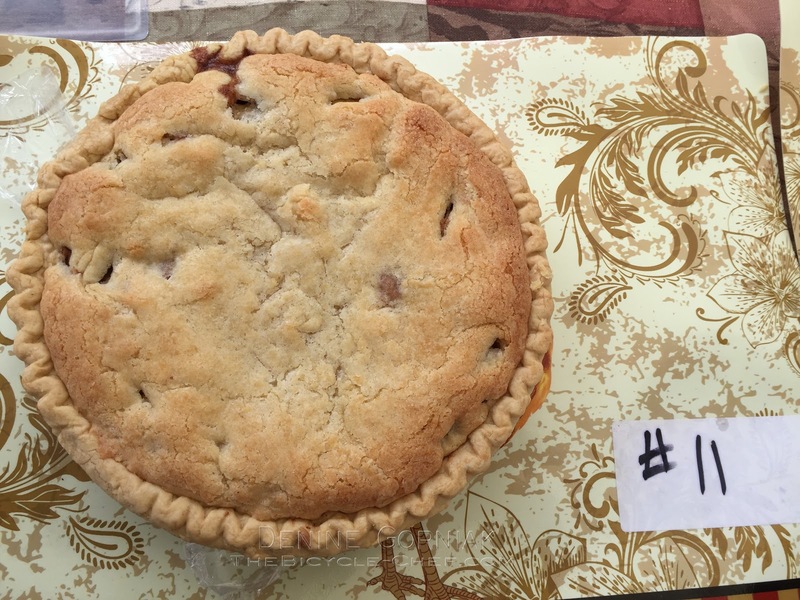 1st Place: #20 Rikki Hein "Lloyd's Apple Pie" - I'm not sure who Lloyd is but his pie was mighty fine (I snuck a taste!). 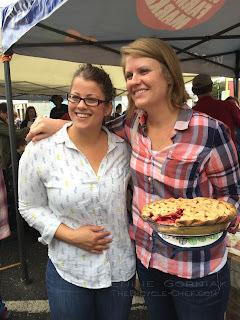 Rikki is also a returning pie baker and winner. She entered our Peach Pie contest this past summer. 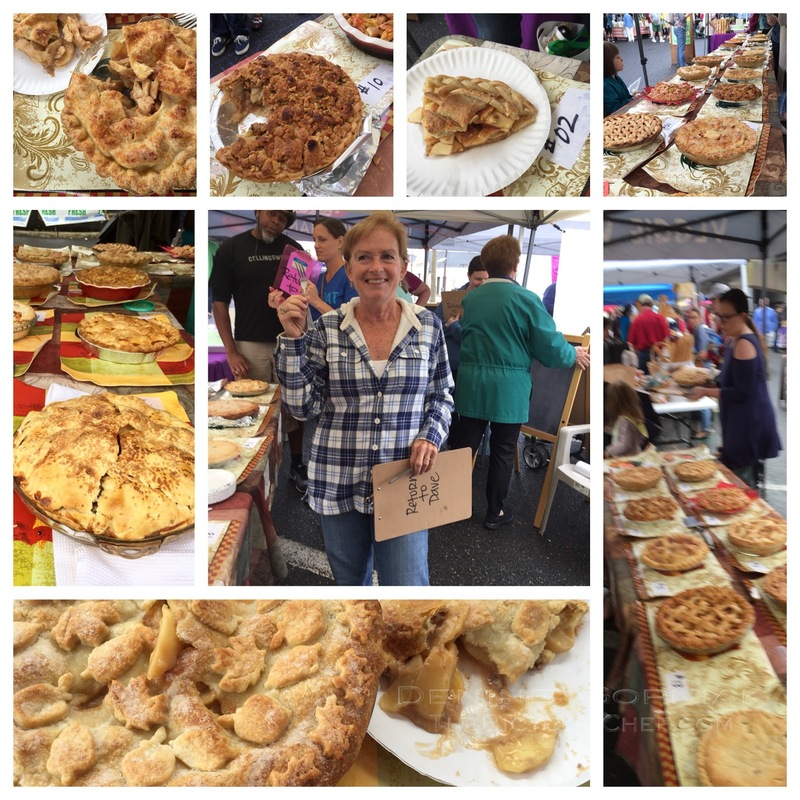 Her pies are vegan - meaning she uses no dairy or animal based products in her pies - they are purely plant based. Her lovely lattice top crust was picture perfect and the raspberries were a surprising counter-punch to her tart and crisp apples. 2nd Place: #22 Emily Thomson's "Caramel Apple Pie" Sweet and lovely, Emily and her pies are all around winners. 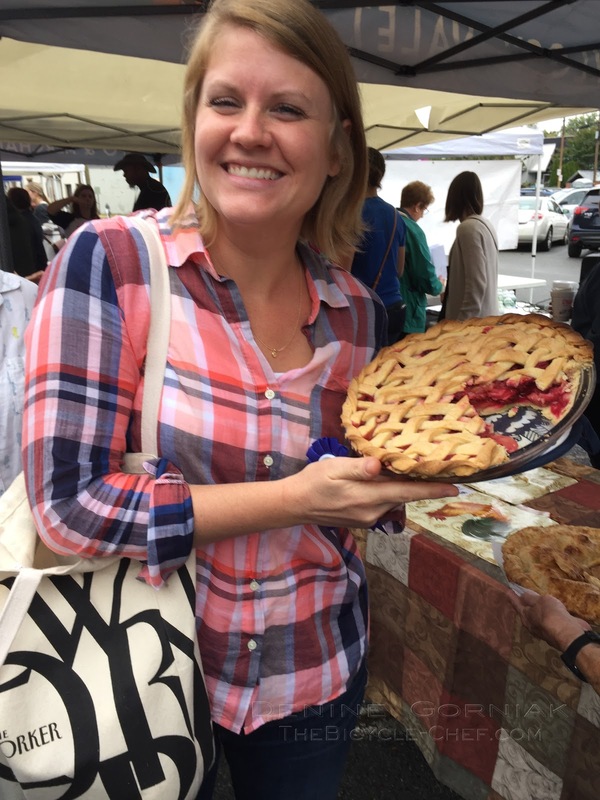 In addition to caramel, Emily used blueberries in her pie. The pie was expertly decorated with cut-out leaves artfully arranged and then further embellished with beautifully crafted pumpkins. Both Emily and her mother are expert bakers having won multiple pie contests at past Collingswood Farmers' Market events. 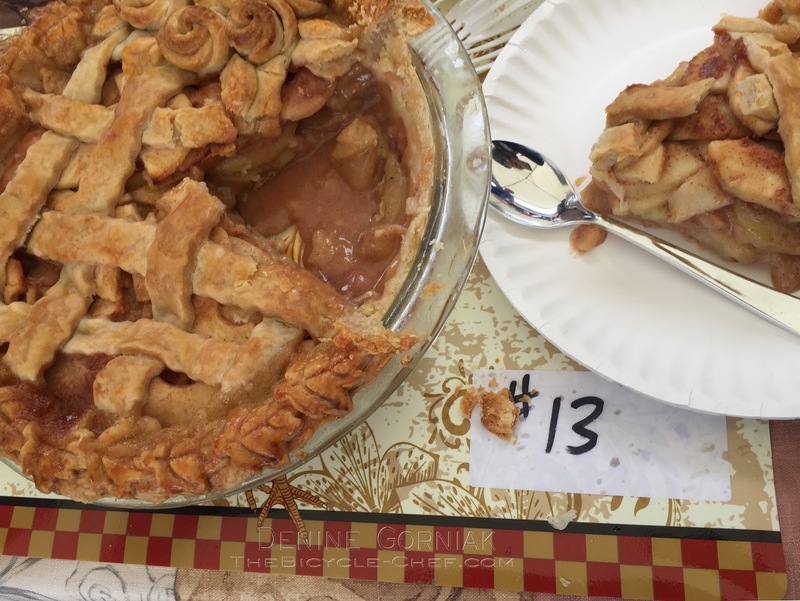 3rd Place: #24 Melanie Whitley's "Honeybee's Delight" Melanie used caramel made from sweetened condensed milk in the pie with the apples which gave the pie structure inside. The beautiful topping was burnished with a perfect caramelized golden brown. Melanie has entered in previous contests, so this lady knows what she's doing when it comes to baking. For all the contestants who baked pies, I offer you my warmest congratulations! 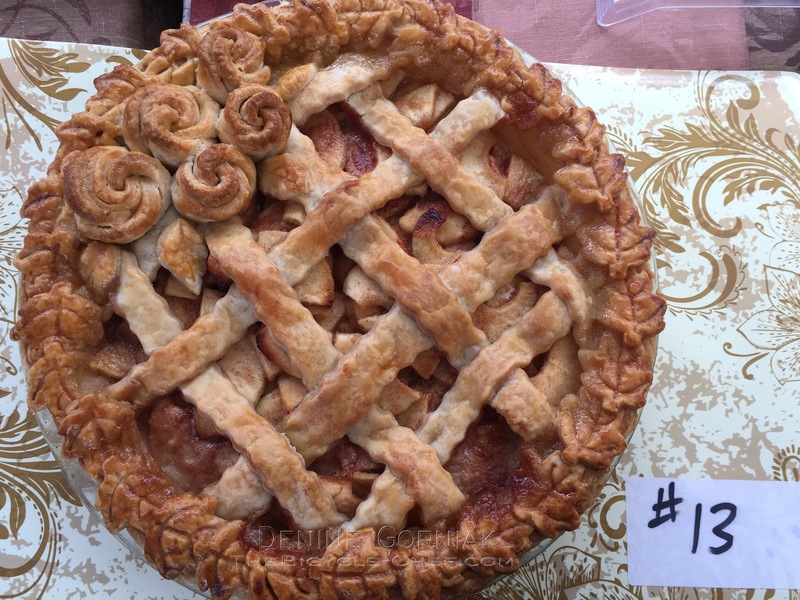 It's so brave of you to bake a pie to share with all of the judges. 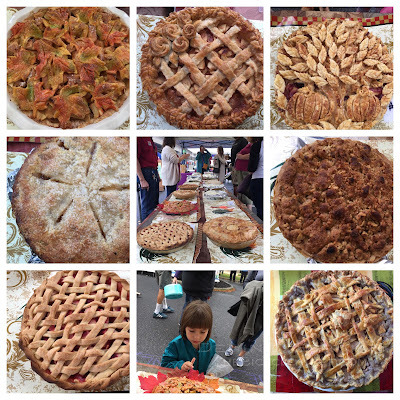 So many of the pies entered were fantastic. I wish we could have more categories so that there would be more prizes to offer. Enter again next year, bring us a warm pie and we'll be happy judges! Keep up the great work! The anxious contestants - many returning bakers from previous contest years here. 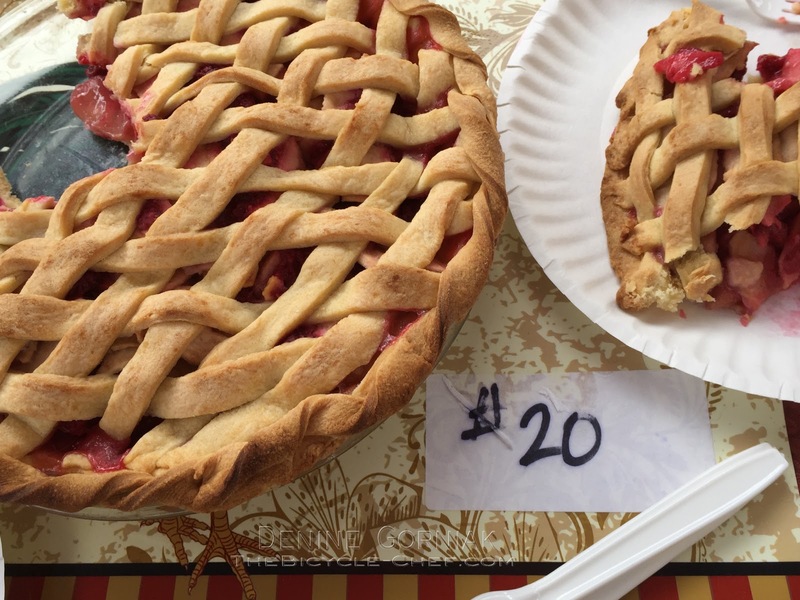 Some of those pies are super fancy! Good tips on judging. 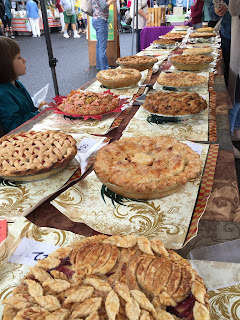 When I judged a pie eating contest there were only 5 pies, 2 of which were savory, so I didn't get sick, but I can imagine the water drinking is a must when tasting a lot of sweet pies.